How much do you know about the Natural Resources Conservation Service’s (NRCS), land and wildlife conservation enhancement practice, also known as the Conservation Reserve Program (CRP)? Could it be a step in the right direction for your gamekeeping plans? These are questions I asked myself after listening to opinions from friends and farmers on both sides of the fence and truthfully, there was a lot I didn’t know about this program. I realized my knowledge was mostly hear-say and my long list of questions needed straight-forward expert answers before I could make the long-term decision of entrusting some of my own land into a government program. It is often said that a farmer’s land is an extension of their yard and for us this is so very true. Every weed is an invader that must be eliminated, every gully is a scar that must be healed, and every crop is a new beginning to be nurtured here on the Valentine farms. We love the land and take pride in caring for it in the best manner possible. A portion of our land has been in row crop rotation for many years. We work diligently to keep invasive species at bay as well as taking measures to prevent soil erosion from these tended fields. This is an ongoing effort and although we win battles, I’m not sure we would win the war if our conscientiousness slacked. Perhaps it is these deeply ingrained practices that set forth such an internal turmoil when it was suggested I put land into the Conservation Reserve Program to “rest, heal and go back to nature.” My interpretation of “back to nature” meant giving up the weed war I had fought so hard for such a long time. I realize that soil gets tired and depleted despite sound farming practices, but the old mindset of putting every acre into productivity is tough to overcome especially when you’ve lived close to the land your entire life. Common sense conversations pointed out a few considerations I needed to address. Some fields are hardly big enough to accommodate the massive tractors and implements used these days by most farmers who tend land on a grand scale. Crop damage from wildlife is a huge loss to those who “rent-crop” trying to make a profit. 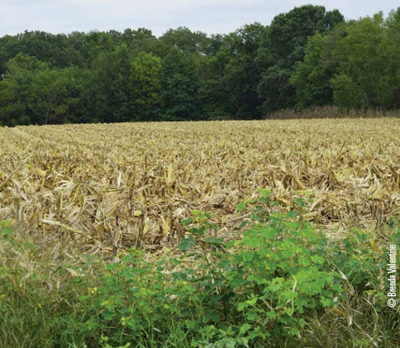 When a grain-crop is planted adjacent to cover it creates an ideal wildlife habitat. The smaller acreages are especially hard-hit by deer, turkey, squirrel, raccoon and other critters looking for an easy meal. On the other side of the coin, I feared I might lose control of my own property that I’ve worked hard to pay for. Plus, the annual rent payment always came in handy with upkeep, taxes and other expenses. 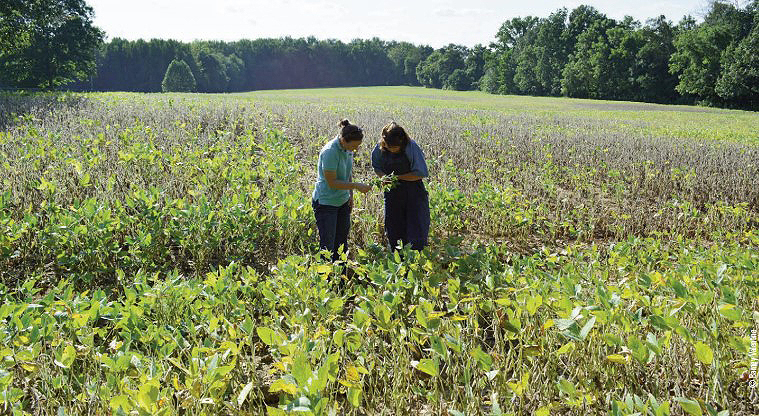 Brittney Viers, Farm Bill Wildlife Biologist, discusses with the author the advantages of the Conservation Reserve Program including soil erosion, land rejuvenation and wildlife habitat. With all of these thoughts and fears keeping me awake at night, I decided it was time to get the real facts about Conservation Reserve Program from an authority. Brittney Veirs is our local Farm Bill Wildlife Biologist. She works in partnership with the Tennessee Wildlife Resources Agency, Tennessee Natural Resources Conservation Service, and Quail Forever. Her two main areas of work are the Conservation Reserve Program and the Environmental Quality Incentives Program (EQIP). A farm-raised girl herself, Brittney was able to enlighten me about the program and answer in plain words the lengthy list of questions I had. She explained that the Conservation Reserve Program was implemented in 1985 primarily to control soil erosion. More recently it is to preserve wildlife habitat and restore natural heritage plants and landscapes. With the variety of habitat necessary for the diversity of wildlife there is a plethora of Conservation Reserve Program programs and incentives available for landowners. Here are the highlights of the information Ms. Viers shared with me. Any land with four years of row cropping history between 2008 & 2013 is eligible. 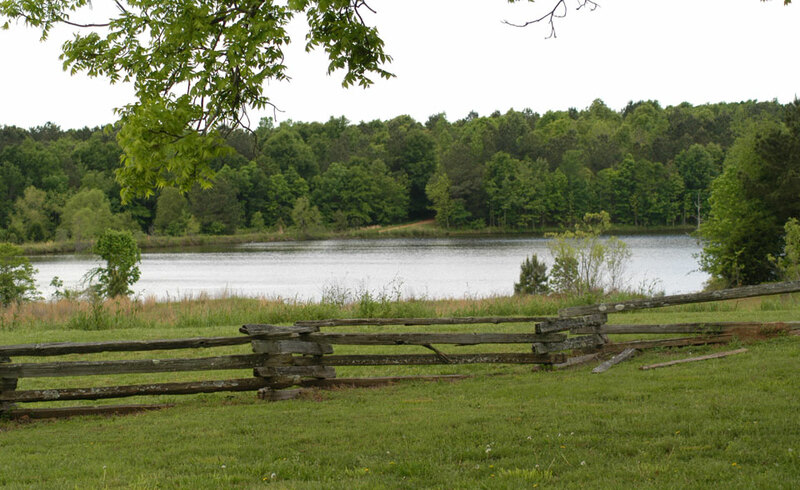 Current landowners must have owned the land for one year to be qualified. There are no acreage amount restrictions, which allow the small landowner as well as those with substantial acreage to take part in the program as long as they meet the above criteria of cropping history and ownership. The program contract has a term length option of 10 or 15 years. The cash rental rate is based on the 3 best soil types within the contracted acreage based on county soil maps and is comparable to or above most crop-share or cash land rent rates. There are roughly 40 various program options to choose from including plantings of native grasses, pollinators, filter strips, riparian buffers, grass waterways, as well as bottomland hardwoods, pines or shrubs. The benefits of contracting row crop land into the Conservation Reserve Program are as varied as the program itself. In addition to the annual cash rent income, there is a sign-on incentive program depending on the chosen practice. This sign-up incentive can vary from $40 to the $150 range per acre for some programs. There is also a 90 percent cost share for the establishment of the chosen cover crop. Many native grasses and pollinator seeds are quite pricey so the cost-share incentive really helps with those up-front planting expenses. There are also cost-share payments made for mid-contract maintenance management practices which I will explain more about later. The program has become especially attractive to landowners who are at the age where they would like to retire from the everyday work grind and gamble of row-crop farming but need an income for incidentals such as property taxes. The financial stability is an appealing angle after years of playing the weather prediction game and crop markets roulette. In addition to the monetary compensations of the Conservation Reserve Program I liked the whole aspect of doing something good for my land as well as for the wildlife I enjoy watching and hunting. The native grasses, shrubs, trees and pollinators will benefit everything from honey bees to whitetail deer. Early successional species such as songbirds, rabbits, wild turkey and bobwhite quail are certain to enjoy improved nesting and brood rearing habitat. The year-round food, cover and bedding provided by the combination of plant varieties will greatly increase the carrying capacity of all game and nongame species. For folks like me that enjoy offering a wildlife buffet, up to 10 percent of the contracted acreage can be planted in the food plot of your choosing. You can even establish brush piles or similar natural cover for additional protection and/or nesting areas for cottontails, wild turkey and upland birds. Plus, soil erosion is minimized dramatically once the native plants are established. The thick cover plantings will also filter many contaminants found in pesticides and fertilizers from entering groundwater, ponds, streams and rivers. This is especially important for fish and all aquatic creatures, wildlife and livestock as well as sometimes our own drinking water. The list of negatives I could glean from all the information Ms. Viers offered was short and some were not really negatives at all. However, I like to make informed decisions so here are a few more details. Once signed, the Conservation Reserve Program contract is locked in for the entire length of the chosen program. If the land is sold the contract stays with the property and is transferred to the new owner. But, the property owner has the option to buy-back the contract before its maturity if so desired. The annual rental rate is locked-in for the original amount of the contract so with fluctuating grain prices there is a possibility of the cost of row crop land rising above (or below) what you are currently receiving from the Conservation Reserve Program. This is a gamble the landowner must be willing to make. fields into an NRCS program. There is also the maintenance aspect to consider. The Conservation Reserve Program is not a plant it and forget it deal. For me, this was actually great news since it assured I would still get that therapeutic tractor time I enjoy so much. The maintenance methods are flexible but the program requires one or more of the prescribed methods be employed for at least two years midway through the contract. Bush-hogging, burning, strip-disking, specific herbicide treatments or a combination of these are all accepted methods of maintaining the desired plant base while keeping unwanted invasive species at bay. There is a 50 percent cost share offered for taking care of your habitat program acreage. The NRCS has standards for seed mixes and species quantities as well as planting guidelines for each program that must be strictly adhered to. Certified seed must be obtained from an approved source. Mossy Oak BioLogic offers an extensive assortment of high quality seeds approved for all Conservation Reserve Program programs in their Native Seed category. I spoke with Dudley Phelps, Team Biologic Research & Development expert at Native Nurseries and one of the most knowledgeable “plant guys” I know. He was especially helpful in recommending species choices within the program guidelines that would enhance my gamekeeping goals. 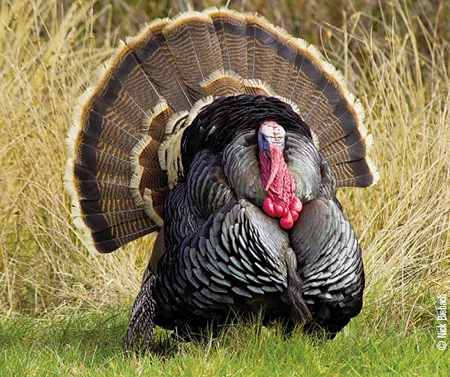 The National Wild Turkey Federation has a great seed program offered to members with many of the program seed blends already mixed in one-acre bags or pollinators bagged for 1/4 acre planting. Pheasants/Quail Forever sells conservation cover seed mixes that meet NRCS standards for a variety of habitat programs or they offer custom mixes. To learn even more about the Conservation Reserve Program and other private lands programs visit www.fsa.usda.gov or drop by your local Farm Service Agency or Natural Resources Conservation Service office and speak with the Farm Bill Wildlife Biologist about a program that fits your land and gamekeeping needs.